Thank you for the lovely comments on my red Parisienne dress. I am very pleased with it and I’m happy I’ve introduced red back in to my wardrobe. Thank you to Jo for the best explanation ever on the difference between Parisienne and Parisian. “Parisienne” means that the noun or person being referred to is feminine. “Parisian” is for the masculine people and nouns. I was a married to a Frenchman for 15 years, so I did pick up some knowledge, other than how to spot a philanderer! When I got home last night I finally got a look at the lining rip I heard while reaching for chocolate at the office. I should also note that both versions of this dress require a hand in getting in and out of. I usually get to work and ask someone to zip me up. I forgot to ask for a little tug down before I left the job. Doh! Serious acrobatics when I got home trying to get myself out! …adding some reaching ease of 1/2 inch or more might help on the next one. Here’s the lining. As you can see, it’s torn about 1.5 inches along the underarm seam line than shredded another 1.5 inches. This wasn’t a problem in my previous dress, but the previous dress was also sewn larger. I’ve slapped a thimbleful of Fray Check on the tear and will probably patch it at some point. I doubt I will actually replace the lining, etc. A patch will do just fine. “ParisiEnne” is French and refers to feminine people and nouns. “ParisiEn” is French and refers to masculine people and nouns. And is English (Parisian) can be either male or female? English has a few gender-specific forms, but they are rare. “Brunette” and “blonde” are examples. Those forms are used only for women. Whew. Thanks Alison, I thought I was going to have to explain it myself :-). Apparently, 15 years isn’t quite enough. But I should know that, my British stepmother lived in France something like 60 years and still missed a gender here and there..
“Blonde” and “brunette” (and “fiance”/”fiancee” with accent marks my computer can’t make right now, dang) kept those forms because English imported those words from French. 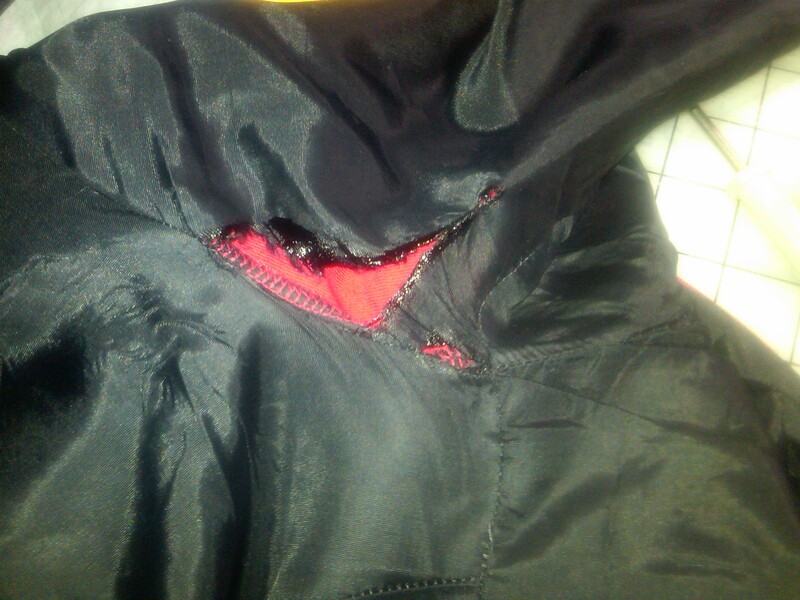 I wonder if on future versions doing a gusset on only the lining would help prevent rips :)? Do you realize that you’ve made 3 red things in a row! I was just looking at your sidebar and saw them…and you look spectacular in red. You should continue to add it to your wardrobe. I agree with you on adding a patch. Your staff must be some down to earth folks to zip ya up. Imagine the funny obstacles folks go through to zip back zippers themselves. Thanks for the mention, as my Grandmother used to say “there is more than one way to skin a cat” and another thought whizzed through my mind. Like Claire mentioned about a possible gusset, I pictured a small wedge of knit lining as it would not add much bulk and certainly stretch for you in just that stressed area. No need to make it large, pin a piece in or hand baste and try the dress on and reach to make sure you are happy. It also reminds me of a male client this year who had ripped the lower half of a parka zipper away from the center front panel. There was no sense of me just tucking it back inside and stitching it down as he would just do it again when he sat down so I sewed a wedge of 2 inch wide elastic to the zipper for 1 3/4 inches and the other side of the wedge to the jacket…ahhh ..instant ease and the wide wind flap covered everything underneath. Sewers have to get creative to please clients and get good Google reviews! I second the gusset idea, why not? I so love that dress! I 3rd the gusset idea – but I’d do it on both the lining and the dress fabric (for your next version, of course). It’s hard to tell exactly from the photos, but it looks like the armscye may be a little low under the arm – contributing both to the tearing lining and your inability to do the dress up yourself. With a gusset and/or raised under-armscye you’d be able to move your arms around much more freely and solve both issues at once! “Parisienne” is the form of the French noun and adjective used to describe Parisian women and to modify nouns of the female gender. “Les Parisiennes” (the (women) Parisians). “La vie Parisienne” ( the Parisian life). “Parisien” is form of French noun and adjective used to describe Parisian men (although, French, like many Romance languages, also uses the plural from to describe men and women, it’s sexist that way). “Le Parisien” means “The (male) Parisian.” It’s also the name of a French newspaper. “Les Parisiens” (Parisians, men and women). Bonus: A slang word for Paris is “Paname.” It comes up in Piaf songs. I don’t know if it’s still used. “New Yorkais” would be used for a male New Yorker or to modify masculine nouns. C’est un New Yorkais. “Les New Yorkais”: New Yorkers. ah…knit lining. I wouldn’t have thought of that. Another ‘lining rip heard round the world’ happened to me at work with a skirt lining on a RTW item which had been tacked down with braided thread at certain spots. I kneeled down to get into the bottom of a filing cabinet and the whole thing gave way and ripped up the entire side of the lining.I think I’m going to steal the knit lining idea to do the repair. Fray Check is my best friend! And I would patch it, too. Love your red dress! The skirt draping is so fun. But — a discreet patch to the lining and all will be fine. The dress looked brilliant on you. How galling about the lining. Well done on being so pragmatic and not screaming the house down! Another vote for a gusset. Good call on Fray Check. Um, just thinking that the lining is taking the stress but it doesn’t eliminate the fact that the fashion fabric might also have some strain. Perhaps a gusset there too would solve the problem. You hardly need advice from me regarding the lining, but I do have a suggestion about how to zip up your dresses. I have a tube turner that I got off the notions wall at JoAnn-it works like a charm. Hook it onto either the hole in the zipper pull (if it’s a regular zip) or the hole where the pull attaches (for an invisible zip). Slip the dress on, grasp the bottom of the zipper and garment with one hand and with the other and carefully pull up and slightly away from the body with the tube turner. It may take a bit of practice but it’s thus far the best method I’ve found if one is minus a helper when one is getting dressed. I’m so sorry, I said it was a tube turner and it isn’t, it’s a loop turner. I found a link that has a picture of the doodad itself though. HTH. I was going to mention gussets but loads of others have beaten me to it. I’ve also started using stretch charmeuse for lining some garments; it helps for some. I love Colleen’s suggestion for doing up zips because I have the same problem. I think I may have to look into this stretch charmeuse. I never really thought about it, but what a great idea. I’m cutting a gusset now (I have today off).